Toyota Aygo (2000 - 2016). Citroen C1 (2000 - 2016). Peugeot 107 (2000 - 2016). Genuine4 Pin Silver / Grey Mini Relay/Multi Use Relay. Relay Colour:Silver / Grey. Made inJapan by Denso. 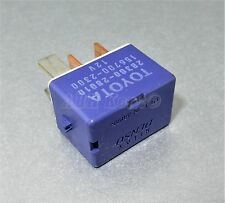 Toyota Lexus 4-Pin Blue Multi-Purpose Relay Denso 90987-T2001 AH156700-3040 12V. 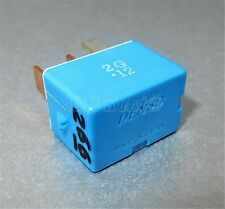 Genuine 4 Pin Light Blue Mini Relay/Multi Use Relay. Relay Colour:Light Blue. GenuineToyota/ Lexus Part. Made inJapan by Denso. 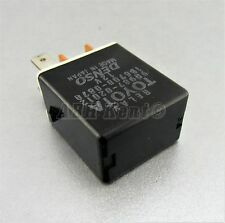 Genuine 4 Pin Black Relay/(Multi Use). Lexus & Toyota:Fits almost all models from ( 1995 - 2010 ). Relay Colour:Black. GenuineToyota/ Lexus Part. Made inJapan by Denso. Toyota:Fits almost all models from (1995 - 2010). ANTENNA AERIAL USED BUT TESTED. 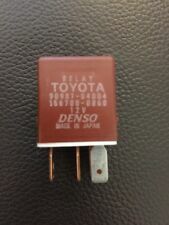 GENUINE TOYOTA RELAY. GOOD WORKING ORDER. Tridon made in USA. 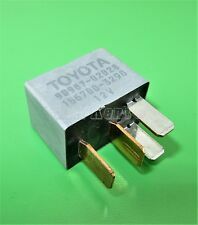 Toyota flasher relay. 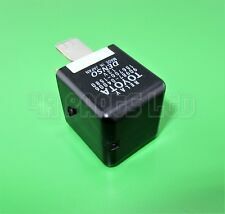 Genuine8 Pin Beige Relay/Turn Signal Flasher Relay. Denso Part Number:066500-4650. Made inJapan by Denso. GenuineToyota Part. Toyota MR2 MK2. Item is from a UK 1991 MR2 MK2 Revision1. Will fit all MR2 MK2's 1989-1999. The engines in the MR2's that we get are 3SFE, 3SGE & 3SGTE - We do not get the 5SFE Engine therefore i know nothing about it. Bosch 0332017307. Toyota Avensis 2003-06. Corolla RAV4. 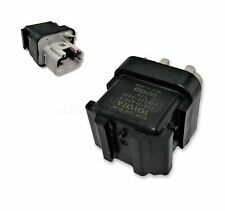 Genuine3 Pin Black Relay/Turn Signal Flasher Relay. 21(23)Wx2 (0-8)W 27Wx2. Denso Part Number:166500-0640. GenuineToyota Part. 27W Max 4 Bulbs. Toyota MR2 MK2. The engines in the MR2's that we get are 3SFE, 3SGE & 3SGTE - We do not get the 5SFE Engine therefore i know nothing about it. Relay is for Rev2 to Rev3 cars.if unsure pls ask. Our cars are right hand drive.again I take no responsibility for any muddle up with Left Hand Drive Cars. Toyota MR2 MK2. Relay will fit all MR2 MK2's 1989-1999. Headlight Retractor Relay. The engines in the MR2's that we get are 3SFE, 3SGE & 3SGTE - We do not get the 5SFE Engine therefore i know nothing about it. 2005-2014 TOYOTA AYGO LIGHT BLUE RELAY. Genuine8 Pin Beige Relay/Turn Signal Flasher Relay. Denso Part Number:MB066500-5340. Made inJapan by Denso. GenuineToyota Part. Genuine 5 Pin Black Relay/Circuit Opening Relay. Made inJapan by Denso. Good Working Order. Condition:Used and Good Working Order. 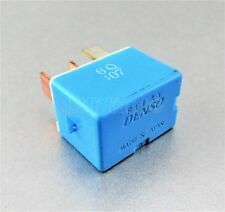 Genuine8 Pin Beige with Blue Base Relay/Turn Signal Flasher Relay. Denso Part Number:066500-5530. Made inJapan by Denso. GenuineToyota Part. Toyota MR2 MK2 SW20. Will fit all MR2 MK2's Imports & UK cars 1989-1999. Indicator Signal Hazard Flasher Relay. The engines in the MR2's that we get are 3SFE, 3SGE & 3SGTE - We do not get the 5SFE Engine therefore i know nothing about it. PART NUMBER: 81980-0D010. Based inWest Yorkshire, Dewsbury our motto is to provide 'Service Excellence as Standard'. collect the item yourself. Cash on collection is also available. Yaris, Celica, Startlet, Lucida, RV4, Avensis, Corolla, Carina.etc. 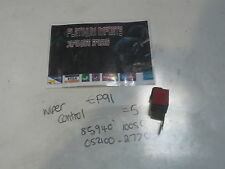 Genuine5 Pin Black Relay. Made in Japan by Denso. Genuine Toyota Part. Colour: Black. Fits both LHD & RHD cars. Good Working Order. Removed from 2009 Toyota Prius 1.5 petrol/ electric, automatic, 5 door. A car has been tested prior dismantling and this part was fully functional. Vehicle compatibility is a rough guide andit is your responsibility to check if this part will fit your vehicle. 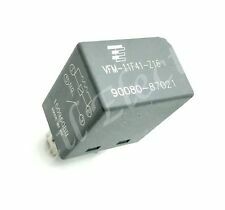 Genuine4- Pin Grey Relay/Multi-Use Relay. 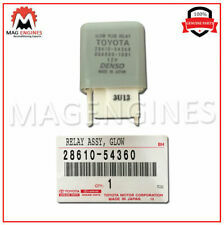 Denso Part Number:AH156700-2900. Made inThailand by Denso. 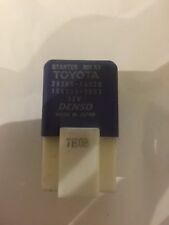 TOYOTA AVENSIS HATCHBACK 2000-2003 RELAY (Removed from a right hand drive car). THIS RELAY IS FROM A YEAR 2001 TOYOTA AVENSIS GS 5 DOOR HATCHBACK 1.8i PETROL ( Engine Code 1ZZ) 5 SPEED MANUAL. Donor Vehicle: TOYOTA RAV4 2.0 D4D 5SP MANUAL 2005. ANY LOCATION OUTSIDE THE UK. Arran - KA27 KA25. Oban - PH 33, PA20-49, PA60-80, KA28. Inverness - ALL. Shetland ZE1-3. Orkney KW15-17. Genuine 4 Pin Mini Beige Relay/Multi Use Relay. Made inJapan by Denso. Good Working Order. 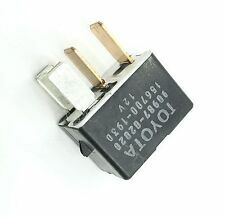 Toyota COROLLA VERSO 4-Pin Grey Relay. 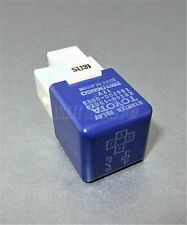 Toyota Lexus Multi-Use Blue Relay Denso. This avoids any later grievances. Co Fermanagh. Manor Auto Salvage. All parts are stamped & marked. Removal or any tampering of the marks will invalidate your warranty. Gearboxes must be checked and serviced with new oil.